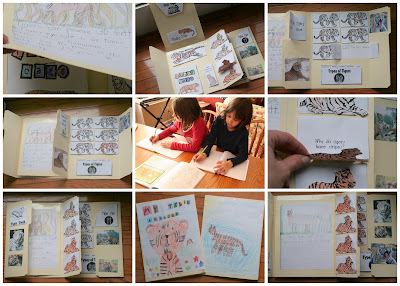 We wrapped up our unit on India with a study on Tigers. We used the lapbook provided by Homeschool Share. The girl's had fun using Draw Write Now again to draw their own tigers and also wrote a few facts in their journal so that we could add the page to our lapbooks. We have really loved using these books to add onto our art and drawing. The girls love to draw and these books have helped them so much! During the week we found several different books about tigers, some fun stories and some fact books that we read and studied together - did you know that a tiger can pounce from a still position up to 30 feet? When we measured it out, we realized that it was almost the length of our entire house. Then we had fun trying to see how far we could pounce...a measly 3 1/2 feet was the record for Zachary! Here are the books we used this week along with our study. I enjoy your homeschool blog and get a lot of creative ideas as I gallop the globe just a little behind you. Can you tell me what kind of folders you use for the lapbooks and where you get them? I'm also on GTG yahoo groups. Thanks.